Annual pilgrimage to the Holy Sephulcre commences along the Via Dolorosa. 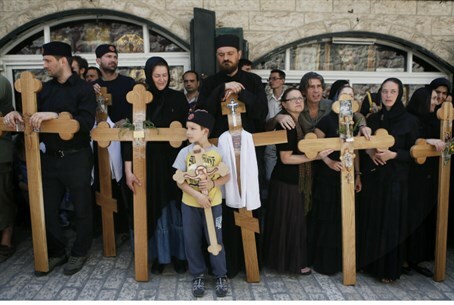 Local Christian Arabs and pilgrims from around the world made their way down the cobbled Via Dolorosa in Jerusalem Friday, where Jesus is believed to have walked to his crucifixion, according to AFP. Thousands of worshippers, some bearing wooden crosses, walked through the walled Old City to the Church of the Holy Sepulchre, the site where they believe Jesus was crucified and buried before rising from the dead three days later. Christians celebrate Friday as Good Friday, a day of penance and fasting which falls on the Friday before the Easter holiday. The holiday is also known as Black Friday, Holy Friday, or Easter Friday.